Let us consider some P&IDs in order to learn how to read and interpret them. As shown in the P&ID, FT 501 is a field mounted flow transmitter connected via electrical signals (dotted lines) to a flow indicator and controller, FIC 501 located in the control room. Please note that a square root extraction of the input signal is applied as part of the functionality of FIC 501. This is because flow is proportional to the square root of the differential pressure being measured by the flow transmitter. To make flow proportional to differential pressure, the square root has to be extracted. The output of FIC 501 is an electrical signal to TY 501 (an I/P converter) mounted in the field. The output of TY 501 is a pneumatic signal which acts on the control valve connected to it. The YIC 501 arrangement is typical of most on/off valves. Here, the YIC is an on/off valve being controlled by a solenoid valve and is fitted with limit switches ZSH and ZSL. ZSH indicates that the valve is open while ZSL indicates that the valve is in closed position or closed. All inputs and outputs are wired to a PLC that’s accessible to the operator (diamond in a square with a solid horizontal line). Firstly let us get an idea of the simple process: The above loop controls the temperature of a process fluid (green lines) by passing the fluid and the cooling medium water into a heat exchanger. The process fluid passes through the tube of the exchanger while water passes through the shell. In the P&ID, TW is a field mounted temperature sensor located inside a Thermowell (TW). 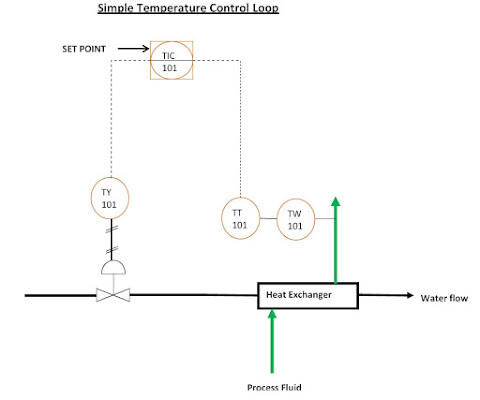 The signal from the sensor is transmitted via a field mounted temperature transmitter TT101 to a temperature indicator and controller TIC 101 located in the control room by electrical signals (shown by dotted lines). Based on the set point in TIC 101, TIC 101 then sends an electrical signal to TY 101 located in the field or plant. TY 101 is an I/P (I to P) converter i.e current to pneumatic signal converter. 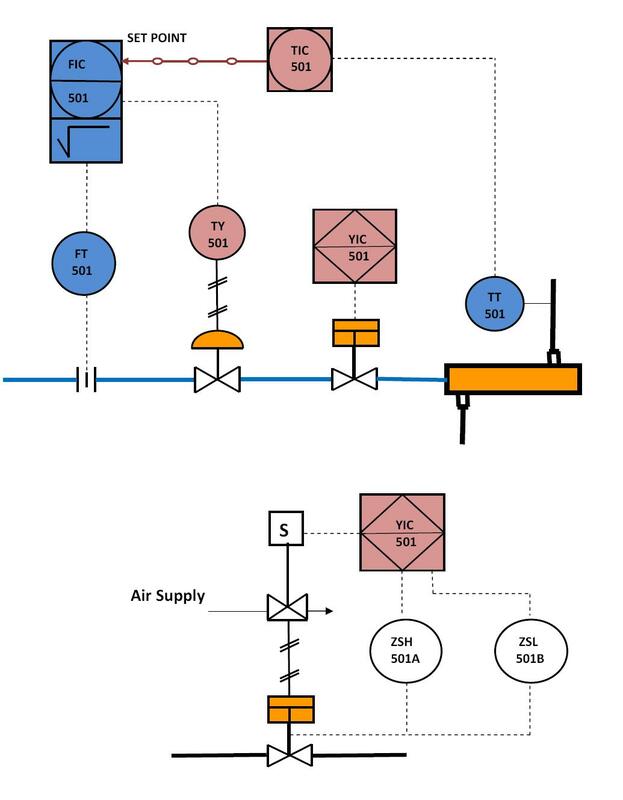 This is because TY 101 receives an electrical signal from TIC 101 and then converts it to a pneumatic signal which then acts on the control valve shown in the P&ID above. The control valve then opens or closes to increase or decrease water flow into the heater exchanger. The key to understanding Piping and instrumentation diagrams (P&IDs) is to familiarize yourself with the ISA P&ID symbols for most process plant instruments and equipment and then try to read as many Piping and instrumentation diagrams (P&IDs) you can lay your hands on. In no distant time, you will be amazed at how well you will be able to read and interpret Piping and instrumentation diagrams (P&IDs).